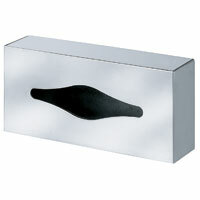 [XPB-987-11] Facial Tissue Dispenser is surface mounted installation and faceplate is fabricated in 22 gauge stainless steel in choice of satin or polished finishes. Tissue container is constructed in heavy gauge galvanized steel and operates with a hinged faceplate with integral catch allowing easy and quick removal of faceplate for servicing. Unit facilitates 200 facial tissues. Specifications and detail information available upon request. For shipping quotes, orders or questions please call our Customer Service Center at 1-877-483-9270.